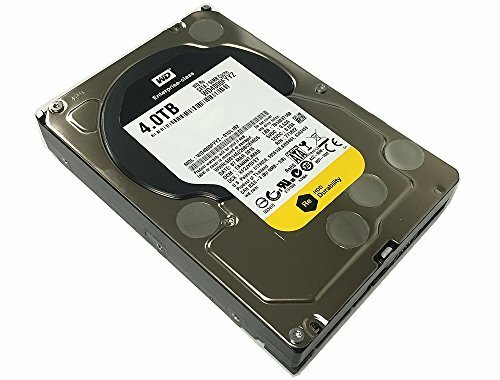 The 4 TB WD4000FYYZ Western Digital RE SATA 3.5" Hard Drive from WD is a powerful combination of enterprise-class performance and high capacity required for superior performance computing and business critical environments. The hard drive delivers transfer rates of up to 6 Gbps and high random I/O rates. It is coupled with a dual processor, which provides twice the processing power to maximize performance. The WD RE SATA Hard Drive's enhanced RAFF technology monitors the drive and corrects both linear and rotational vibration in real-time. It thus provides optimum performance even in high vibration environments. It features a head positioning system with two actuators which improves positional accuracy over the data track(s). The featured motor shaft on both ends minimizes the system-induced vibration and stabilizes platters. This enables accurate tracking of read and write operations. The multi-axis shock sensor feature automatically detects the subtlest shock events allowing you to protect the data. The WD RE SATA Hard Drive's Time-Limited Error Recovery (TLER) feature prevents drive fall-out caused by the extended hard drive error-recovery processes. The NoTouch ramp load technology ensures that the recording head never touches the disk media. This allows significantly less wear to the recording head and media as well as enhanced drive protection in transit. Thermal cycling guarantees that each drive is tested by an extended burn-in for reliable operation. Dynamic fly height technology enables each read-write head's fly height to be adjusted in real-time for optimum reliability. With 64 MB cache, the WD RE SATA Hard Drive ensures faster data transactions. It is ideal for use in servers, video surveillance and other demanding write-intensive applications demanding write-intensive applications.